OGS Daycare Center Project | Oak Ridge Foam & Coating Systems Inc.
Over twenty-five years ago, this facility was a cafeteria for the Harriman Campus, which had a SPF/silicone roofing system installed. The installation never leaked. 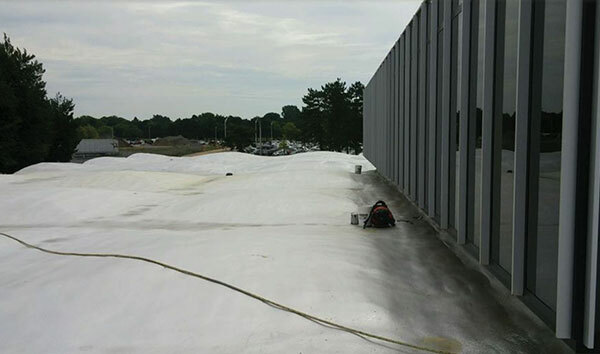 In late 2014, Springline Design contacted Rich Franklin of Franklin Consulting to develop a specification for the requested roofing system. Today, it has been totally renovated into the governor’s pet project as a daycare facility. 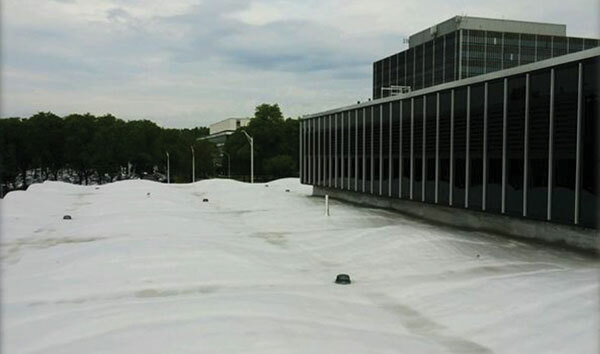 With this renovation, the scope of work included removing the old roof and failing vapor barrier, and re-installing a spf/polyurea roofing system developed by oak ridge foam & coating systems, inc. of Green Lake, Wisconsin. The project called for 80 dry mils of OR80SLM to be applied to a sealed/primed concrete substrate as the new vapor barrier. The next component involved installing a minimum of 4.5 inches of 3 lb. Density spray foam insulation, sloped to drain positive, and then applying an additional 80 dry mils of the OR80SLM as a protective topcoat. The low bidder, Akros Management, chose eastern bridge works as the installation contractor. Overseeing the project was the office of general services for the state of NY. OGS mandated that during the entire job progress there would be no water leaks into the newly renovated interior. The contractors kept them dry, even during the wettest of days! Twelve weeks later in August 2016, the project was completed and a final inspection was conducted, resulting in the issuance of a twenty year labor and materials warranty from Oak Ridge.